When replicating large amounts of data over a WAN link, it is desirable to avoid full resynchronizations which can consume large amounts of network bandwidth and time. DataKeeper avoids almost all full resyncs by using its bitmap technology. However, the initial synchronization of the data, which occurs when the mirror is first created, cannot be avoided. 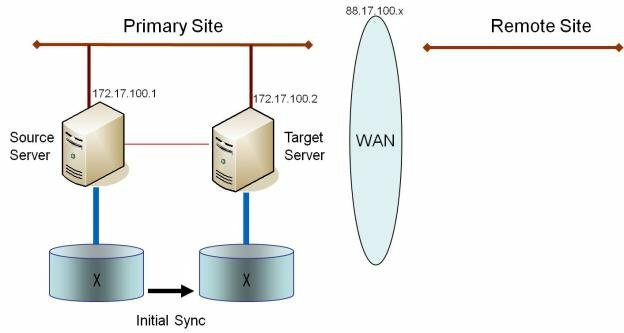 In WAN configurations, one way to avoid the initial full synchronization of data across the WAN is to configure both systems on a LAN, create the mirror and allow the initial full synchronization to occur across the LAN. Once the initial synchronization is complete, update the IP addresses for the source and target, which will place the mirror in the Paused state. Move the target system to its new location. Once the target system is in place, power it on and verify all network settings, including the IP address that was updated. On the source system, run the CHANGEMIRRORENDPOINTS command. The mirror will be CONTINUED and only a partial resync (the changes that have occurred on the source volume since the mirror was PAUSED) of the data is necessary to bring the TARGET volume in sync with the SOURCE. *Note: This command supports changing the endpoints of a mirrored volume that is configured on 3 nodes or fewer. For configurations greater than three nodes, create mirrors with the final endpoint at the local site and use route adds to get the mirrors created and resynced before moving the server to the final location/address/DR site. Using the DataKeeper UI, create a mirror on Volume X from 172.17.100.1 to 172.17.100.2. Note: Connecting to the target by name is recommended so DNS name resolution later will automatically resolve to the new IP address. Update the IP address for the network adapter for the source to 88.17.100.1 and update the IP address for the network adapter on the target to 88.17.200.2. This will place the mirror on the source side into the PAUSED state. Ship the target machine to its new location. Power on the target machine and verify all network settings, including the IP address updated above. DataKeeper will resync the changes that have occurred on the source server while the target server was unreachable. When this partial resync is complete, the mirror will change to the MIRRORING state. Pause the mirror and unlock the target volume via the Pause and Unlock mirror option in the DataKeeper UI. Use the DataKeeper command line interface (EMCMD) to pause the mirror (PAUSEMIRROR) and unlock the target volume (UNLOCKVOLUME). Once unlocked, the target volume is completely accessible. When finished inspecting the target volume, be sure to continue the mirror to re-lock the target volume and allow DataKeeper to resync any changes that occurred on the source volume while the mirror was paused. Any writes made to the target volume while it was unlocked will be lost when the mirror is continued. !If a reboot is performed on the target system while the target volume is unlocked, a full resync will occur when the target system comes back up.